Nova is a pretty and friendly young female who is the last of her litter, still waiting for a home long after her siblings were adopted. We can't figure out why, as Nova is a complete package who ticks all the boxes of desirable cat qualities. 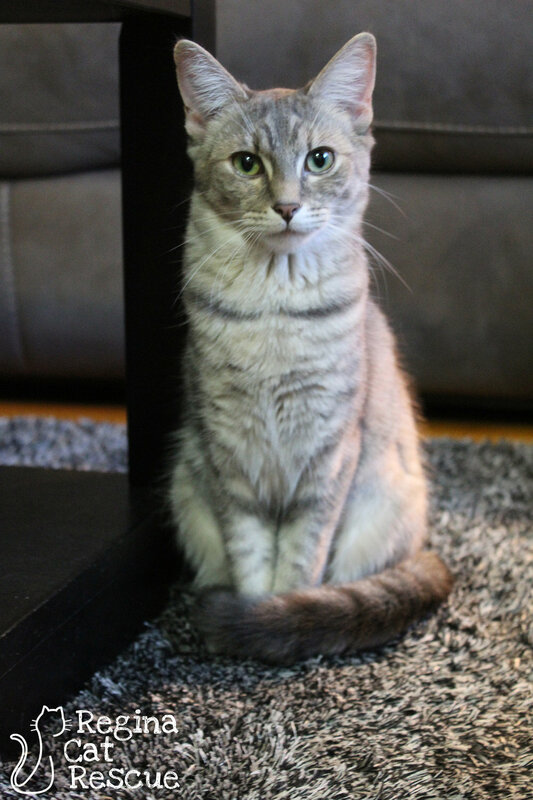 Nova is friendly, affectionate, playful and well socialized with other animals. She fits in well with her busy multi-pet foster family and brings them a lot of joy. She’s a spunky girl, full of energy and curiosity and she loves to explore. Nova is a lot of fun and keeps her foster family laughing with her crazy antics. Once she’s sleepy, she loves to curl up beside you, or snuggle in beside you under the covers and purr away. Nova's beautiful tabby markings match her beautiful heart and guarantee that Nova's lucky adopter will be rewarded with love and affection. If you are interested in Nova, click here to view our adoption contract and click here to complete an adoption application or email the RCR Adoption Coordinator at adoptions@reginacatrescue.com for more info.